This is not an April Fools joke! Typewriters are wonderful. Obsolete, sure. But they're beautiful, satisfying to use, and, hey, they work really well. Here's LIFE's salute to the machines and the wonderful people who used them, like cat lover (?) 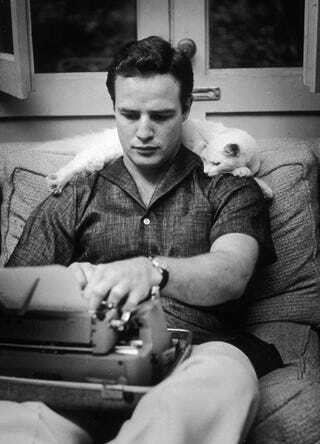 Marlon Brando, up top. War correspondant William Chickering wrote his stories as they happened, via typewriter—here, aboard a troop transport ship on its way to France. You may have read some of William Faulkner's splendid fiction, but were you aware of how cool-looking he was? Here he is, typing away in Hollywood. Edward Knoblock, a screenwriter for the Three Musketeers film, seems a bit distracted by an actor's rehearsing. Although, when you take sword-swinging, mustachioed dudes out of the equation, a typewriter is relatively distraction-free. For the rest of the wonderful photos, head over to LIFE.